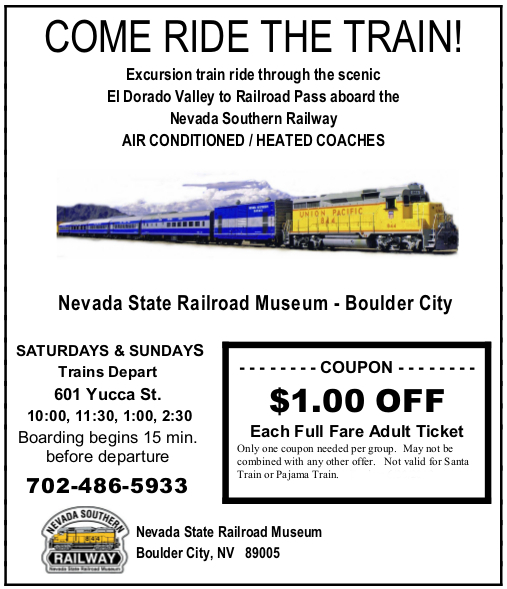 Coupon Specifics: Print and redeem this Southern Nevada Railway coupon to receive $1.00 off each full fare adult ticket purchased. Only one coupon needed per group. May not be combined with any other offer. No cash value. Come ride the Nevada Southern Railway Historical Excursion Train in historic Boulder City, Nevada – the city that built the Hoover Dam. Ride the rails and experience history dating back to the 1930’s – the time this Boulder Branch Line was constructed by the Union Pacific Railroad to service the Boulder Dam project. Ride in your choice of an open air car, or air conditioned / heated Pullman coaches. And yes, we are wheelchair accessible. The Nevada Southern Railway excursion train departs from the Nevada Southern Railway station (off Yucca Street) and travels 3.5 miles west along the historic Boulder Branch Line to Railroad Pass located within the River Mountains range. The round trip (7 miles) lasts approximately thirty-five minutes in duration. The train runs on Saturdays and Sundays. Departure times are 10:00 am, 11:30 am, 1:00 pm and 2:30 pm (boarding begins 15 minutes before departure). Take US-93 south toward Boulder City. After passing the traffic light at Veterans Memorial Drive, proceed 0.7 miles to Yucca Street (just past the Taco Bell). Turn left onto Yucca Street, and the train station for the Nevada Southern Railway is on your right.